Ashley Broomhead sits on the DIS coaches' panel. Having been a keen tennis player from youth to veteran level – winning the men's 50s doubles at Wimbledon in 2010 – Ashley Broomhead has also pursued a successful career in coaching, working as a level five Masters Performance Coach, as a Master Tutor for the LTA Coach education Programme and the Derbyshire Institute of Sport (DIS). "I started playing Tennis when I was 10 years old, with my mother and father as key influences in my tennis development. Both played for the senior Derbyshire teams, so I was around a lot of tennis. "My main sport up to 14 or 15 was football, and I played for Chesterfield's youth team. However, at that age I became more interested in tennis and by the age of 16, I was practicing with many of the county men's team and representing the senior men. By the age of 18 I was ranked in the top 10 juniors in the country. "I then combined my tennis with a teaching degree in PE and Geography, while pursuing my coaching qualifications, and I achieved my Professional Registration qualification at 21. "In 1979, I did not go into teaching, but joined up with a fellow coach, Keith Reynolds, to own and develop a tennis club in Alfreton, Watchorn Tennis Club (now Ripley and Alfreton Tennis Club). "We were the first to have a two-court indoor dome in the country and the first to put down American clay courts, so our aspiring players could train on a surface similar to that in Europe. In 1994 we were awarded 'Club of the Year' by the Lawn Tennis Association. "This was a thriving club, with a blend of club activity and also performance coaching, which nurtured over 30 national champions and players going on to compete in Grand Slam events around the world. "I was Derbyshire County Performance Officer from 1996 to 2006, with the brief to develop national and international players. Many international juniors came out of this small rural county. "I also competed for Derbyshire for over 20 years, with eight years in the top county division. I also competed in French tournament events and have represented a club in the German League for over 20 years – and still do at vets level. "I have 26 senior county titles to my name, 15 national titles, including two Wimbledon vets doubles titles, have represented Great Britain in three vets World Team events, and achieved six European Club Championship bronze medals. "After 2006, I worked as a senior coach at the Nottingham High Performance Centre, one of six in the country, and am still associated with it in delivering the Apprentice Scheme for 16 to 18-year-olds. "For over 20 years I have delivered Coach Education Courses at Level 3 and 4 (five being the highest in tennis) all over the country, and am a LTA Coach Education Master Tutor. 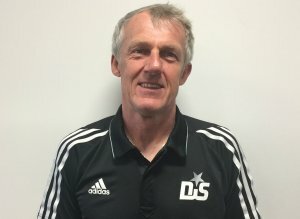 "At present, I am the senior county coach for Derbyshire, coach to the Nottingham University Tennis Teams, Tutor for the LTA , a manager of the Apprenticeship Scheme at Nottingham Academy, a coach at Duffield Tennis Club, and sit on the coaches' panel associated with the Derbyshire Institute of Sport (DIS). I also play and compete as time allows. "Through my tennis experience I can speak French and German, I enjoy skiing, take part in fell races, and enjoy playing the guitar. "I try to experience life as much as possible, I enjoy helping people develop their own potential to go further than they think they can." Want to coach or volunteer?